Nothing much has been happening. Work today. I think it must be a full moon as all the loonies were out today. Not that you can see the moon behind our gorgeous glorious grey skies. Have I ever told you I love the rain? No? Well I do. I love the sound of it, the feel of it and the smell of it! I just love it! I really have to get Steve behind the camera I think. Just so I can do some layouts about ME for a change and about the things I love. So I have decided to share some layouts that I have been doing. I have been very scrapblocked for weeks! I go to the garage and just look at my supplies and think 'oh this is all too hard'. And then I trawl the internet and just generally get bored over the whole scrapping ordeal. But I think I am getting my mojo back a little. 'Bout time and just in time for a project I have been asked to do. Very excited about this! Ok, so this layout, Seal of Approval, wins the award for having the lamest, cheesiest title ever! Oh well. What else could you call it?! LOL! The photos were from our trip to Nambucca Heads last year. We went to Pet Porpoise Pool. Kate got to pat the seal and feed it a fish. I love that place! The show is awesome adn you get to pat the dolphins. I love dolphins. They are so graceful and beautiful. Growing up though, my favourite was the killer whales. Now that is a beautiful species! 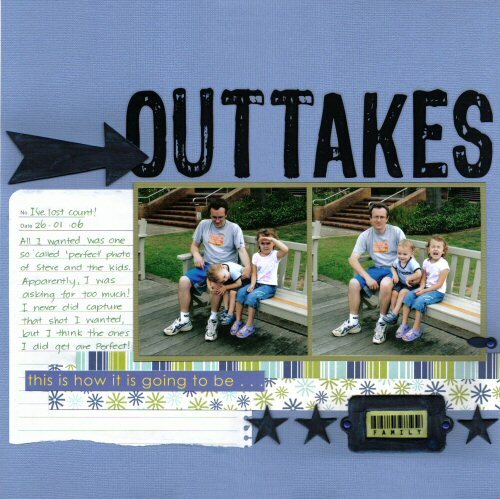 I also managed this layout, Outtakes. I love it! I have had these photos for ages. We went to Nurragingy Reserve on Australia Day and Steve and the kids sat down and I thought 'wow, that would make a great photo!' Of course they couldn't sit still. Kate is sneezing, Luke is lying down, Steve is squinting. I just could not get *the* perfect photo. But you know what, life ain't perfect and I love living in my little imperfect life! So, with all that scrapping stuff, I have been having some late nights, so I think it is time for me to go to bed. I may even wake up early, 5.30 :O, and go for a run. Maybe. Yeah. Probably not. It is still supposed to be raining tomorrow. Oh well. Will give it a miss then. Even though my mum doesn't visit here, I just want to give her a shoutout as she had a hip replacement last week. Not even 50 years of age. So thats what I have to look forward too. EEK! Get well Mum! Hi Beth...love you latest layouts...its so lovely to see them uploaded all at once...particularly love the outtakes one...LOL at trying to get everyone to do the camera thing all at once...I think its just made these photos even more special. Im so looking forward to seeing your next Bugs layout ...Im sure its just beautiful as usual. Fantastic layouts Beth, I love them all. You have lots of mojo according to what I see here. Terrific photos, colours and style. Hi Beth, love your layouts, the 1st layout is stunning. Especially love the colours in the bliss layout! Oh Beth, I've been soooo slack with the blog hopping lately so haven't called in for a while!! Love love loving your gorgeous work, especially the Bliss one, it is sensational!! I love the rain too..but only when I'm at home and especially when I don't have to go out anywhere. Sorry to hear about your Mum...I hope she's feeling better. Gee..shes young for a hip replacement. Your layouts look magic. 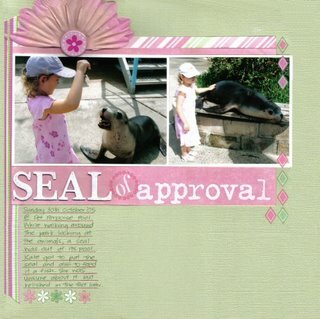 And lol at your Seal of Approval....I think it's probably the exact title that I would have come up with too!! Yeah get steve onto it. I'd love to see more layouts about YOU! Gorgeous layouts as always. Can't wait to see your new layout in the MB newsletter! I hope your mum's feeling ok.